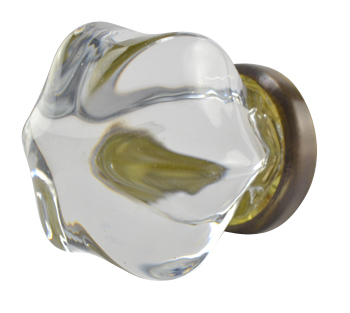 1 1/2 Inch Crystal Clear Glass Cabinet Knob (Antique Brass Base). This Knob measures 1 1/2 inches on the hexagonal with a projection of 1 2/5 inches. Knob comes complete with hardware and base is available in polished brass, antique brass (shown), polished chrome, and brushed nickel. Note that this 1 1/2 inch knob is significantly thicker glass than the matching cabinet pulls and may appear darker in color due to the thicker glass. This is a traditional look for colored glass.